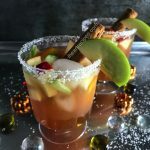 These Thanksgiving Margaritas are the bomb! It’s like spiked apple juice, with a splash of orange, and maple. I like my margaritas on the rocks, but if you prefer to blend this margarita recipe you can! Add ice, and sliced fruit in the glasses.